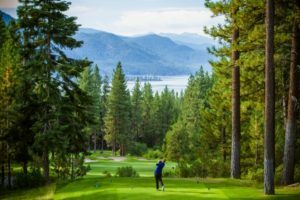 The golf season is in full swing in Lake Tahoe. To the delight of local golfers and tourists, both the Championship Course and the Mountain Course at the Incline Village golf complex are in great shape this season. The Incline Village Mountain Course is celebrating 50th year and has a new Head Golf Professional – Nevada native Jessica Dugan. The Incline Village Championship Course and the Mountain Course began offering play May 18. The Mountain Course is celebrating 50th year and has a new Head Golf Professional – Nevada native Jessica Dugan. Dugan was born in Carson City and raised in Yerington, Nev. She has been a Teaching Professional and Assistant Golf Professional in North Carolina, Arizona, Nevada, California and Florida, and has been a Class A PGA professional since 2006. In the 2007 summer season, she was the first assistant at the Incline Village Mountain Course and earned the prestigious “Summer Seasonal Employee of the Year Award.” She is excited about returning to Incline Village as the head pro. Bunker Project: The Incline Village grounds crew has been working the last four years on a major bunker renovation project. Play Passes: Choose from a variety of passes to find the option that will fit your schedule and budget. The new Afternoon All You Can Play Passes are a great value. View prices here. Punch Card Promotion: This spring promotion will allow golfers to use the remaining value of their 2017/2018 expiring Punch Cards toward the purchase of a Mountain Course Play Pass. Promotion valid through May 31. Register for Get Golf Ready: Are you new to golf or returning after many years? “Get Golf Ready” is a series designed to teach everything a golfer will need to play in five lessons. Cost is $150. Incline Village is also offering some Level 2 courses for advanced golfers who already know the basics. View schedule and register online. The Incline Village courses are located at 955 Fairway Blvd. For more information, visit www.golfincline.com.